All of a sudden, we’re deep into the holiday season, which means your schedule is probably packed with parties and seasonal events. That doesn’t mean there aren’t loads of other things going on when you do get a night off from life on the holiday circuit. Here are a few of our favorite things to do this week. Rescheduled from earlier this year, Donald Glover finally appears at the Forum tonight as his musical persona, Childish Gambino. If you’re among those for whom “This Is America” is a contender for song of the year, you might want to catch the show, since we hear he may not be back in the L.A. area until a certain springtime music fest in the desert. The eternal question: Is Die Hard a “Christmas movie”? As a society, we may never reach a consensus, but it is, at the very least, “Christmas adjacent” and that’s good enough for the ArcLights in Hollywood and Santa Monica to justify screening the 1988 classic tonight. Hop aboard the retro Long Beach Trolley for a tour of extravagant holiday-light displays. 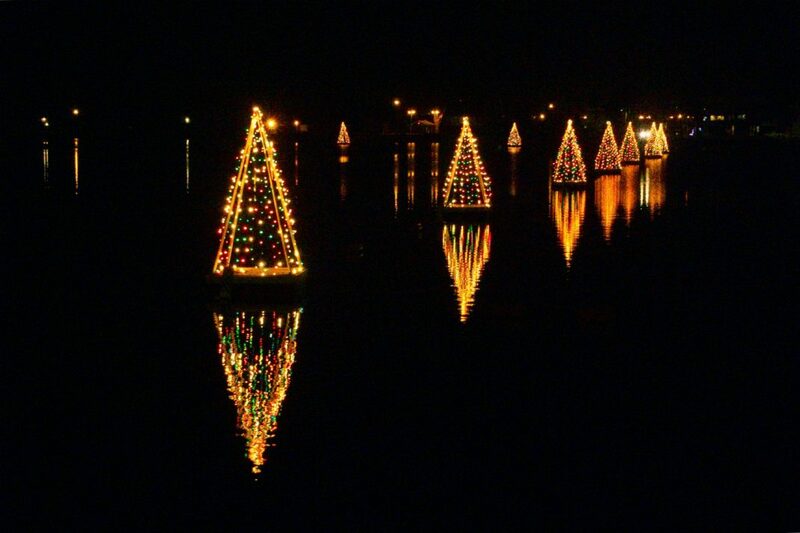 You’ll nibble cookies, sip hot chocolate, and see the famous “floating trees” of Alamitos Bay along the way. Tours are offered nightly through December 30. If there is one thing this year’s Grammy nominating committee got right, it was all the shine given to R&B star H.E.R. Sure she’s been on the scene for a minute–Radio Disney even named her the “next big thing” when she was 12–but 2018 was a breakthrough year. This medley show at the Wallis Annenberg Center for the Performing Arts spins through the best musical numbers from shows that have come out recently. You’ll get a sampler platter of song-and-dance routines, find new favorites, and discover the work of emerging theater talent. Spend an evening with the voices of San Cha, Dorian Wood, and Aaron Marco in the intimate setting of downtown’s Love Song Bar, attached to the Regent Theater. Entry to this event is free; donations will be accepted to raise funds for Carecen, a charity doing urgent work with refugees from Central America. Get a full winter wonderland experience at this family-friendly event. Look for horse-drawn carriage rides, Christmas trees, decorations galore, a Santa’s village, gingerbread-making areas, a holiday shopping market, seasonal film screenings, ice-skating, a petting zoo, and more. Next article10 Cultural Moments That Defined 2018 in L.A.